Why is Baghdad advancing against the Kurds now? Iraqi Kurdistan, which has enjoyed de facto full autonomy from Baghdad since the end of the First Gulf War in 1991, may have overplayed its hand when it went ahead with a symbolic independence referendum on September 25, despite warnings from both regional rivals and allies, including the US. Ninety-three percent of the voters said they endorsed a Kurdish nation state, but regional capital Erbil has provoked reprisals that Baghdad – supported by Turkey and Iran, which have their own restive Kurdish minorities – had promised in advance. "It is my constitutional duty to work for the benefit of the citizens and to protect our national unity that came under threat of fragmentation as a result of the referendum that was organized by the Kurdish region," Iraqi Prime Minister Haider al-Abadi said as tanks rolled towards the northern city. "The referendum came at a time where the country is fighting against terrorism that has come in the form of ISIS [Islamic State/IS, also ISIL]. We tried to urge the Kurds not to violate the constitution and to focus on fighting ISIS, but they did not listen They chose their personal interests over Iraq's interests." Although it borders the recognized Kurdistan Region, it is not an official part of it, and its participation in the referendum vote was particularly infuriating for the Iraqi government. In fact, the population of the region, which numbers over 1 million people, is split between Kurds, Arabs and Turkmen, and some of Kirkuk city’s residents have welcomed the incoming militias, just as others have fled the city. The region had been under increasing Kurdish control since the US-led invasion of Iraq in 2003, and particularly after 2014, when the retreat of the Iraqi Army in the face of the IS threat created a vacuum which the Kurds stepped into. In subsequent years, they had instituted various policies to solidify the Kurdish identity of the region, including incentivizing Arab families to sell up and leave. Historically, Kurds believe that Kirkuk is a fundamental part of any future state – often referring to it as “our Jerusalem” – and still resentfully remember the policies of ‘Arabization’ in the 1960s and 70s that tried to integrate the region into Iraq, partly by bringing in sizable Arabic populations and deporting Kurds. Is it about the oil? While the oil contained in the ground in Kirkuk is important to both sides in the long run, tactically the impact of losing the fields is likely to be more painful for the Kurdistan Region. The 250,000 barrels per day produced in the governorate represent more than a third of the oil output of the entire Kurdish autonomy, while Iraq pumps out more than 4 million barrels daily from its other oil fields. Still, Baghdad regards the Kurds’ unwillingness to share the proceeds from the export of hydrocarbons in the past half-decade as unfair. How have the Kurds responded to Baghdad’s offensive? In the days prior to the invasion Kurdish politicians united in telling Baghdad that they would not declare their referendum null – a condition imposed by the government – nor give up Kirkuk, but in the past hours the surrender of the region has triggered a flood of recriminations and empty calls. The Peshmerga command said Iraq’s advance was a “declaration of war” and urged its troops to “resist and defeat” the Shiite militias who led it, while accusing one of Kurdistan’s leading parties, the PUK, of “great and historic treason” for abandoning key positions. But late on Monday, a Peshmerga commander said the retreat was “not a mistake,” noting that their forces had been “outnumbered.” Masoud Barzani, the president of the Kurdistan Region, issued a face-saving statement that urged fighters to avoid confrontation, yet gave them a “green light” to fight back if they are attacked. The actual amount of violence on the ground has been reported as negligible by the Iraqis, and more substantial by the Kurds, who have said that their countrymen have been killed, and houses have been looted and burned. What has been the US approach to mediating the conflict in its anti-IS coalition, and can it do anything? Indecisive and ineffectual. Prior to the referendum, Washington said that it would not support Kurdistan in any conflict that might arise from its independence declaration, but waited until two days before the vote to send a letter in which it proposed a diplomatic solution – a postponement of the referendum for one year, in exchange for substantive talks – by which time it was too late. As the conflict loomed in the past days, and eventually boiled over, the US was left to react. “We’re not taking sides, but we don’t like the fact that they are clashing. We’ve had for many years very good relationship with the Kurds, as you know. And we’ve also been on the side of Iraq,” said Donald Trump on Monday evening. 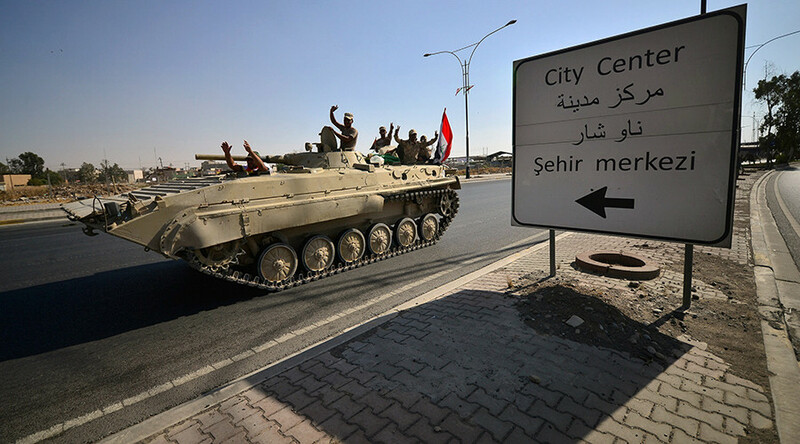 Some have expressed concern that Washington’s bête noire Iran, which has close links with the Shiite government in Baghdad, and whose forces Kurds claim are in Kirkuk, now has the upper hand in Iraq, which would represent a humiliating defeat for US foreign policy. Other are worried that the infighting could spark a resurgence in Islamic State. “ISIS remains the true enemy of Iraq, and we urge all parties to remain focused on finishing the liberation of their country from this menace,” read a statement from the US embassy in Baghdad. But more likely this is a fight for the spoils of its defeat among situational allies who have lost a common enemy. More alarming than the current Islamic State threat is that Iraq once again appears to be in identical conditions to the ones in which the terrorist group appeared in the first place – riven by ethnic and sectarian divides, with a central government that is lording it over embittered minorities keen on more autonomy from it.